In a large mixing bowl, cream together the butter and sugar. Add the eggs, one at a time, beating well after each addition. Beat in the extract. In a separate bowl, mix together the flour, baking powder, and salt. Stir in 1 cup of the crushed peppermint candy. Gradually add the flour/candy mixture to the creamed mixture, beating until blended (the dough will be stiff). Divide the dough in half. On a baking sheet, roll each half into a 12-by-2½-inch rectangle. Bake at 350 degrees for 25 to 30 minutes, or until golden brown. Leave the oven on. Carefully remove the loaves to wire cooling racks and cool for 15 minutes. On a cutting board, cut the loaves at an angle into ½-inch-thick slices. Place the slices, cut side down, on baking sheets. Bake 12 to 15 minutes until firm. Melt the white chocolate, then drizzle it over the cookies in a swirled design and sprinkle with any leftover crushed peppermint candies. 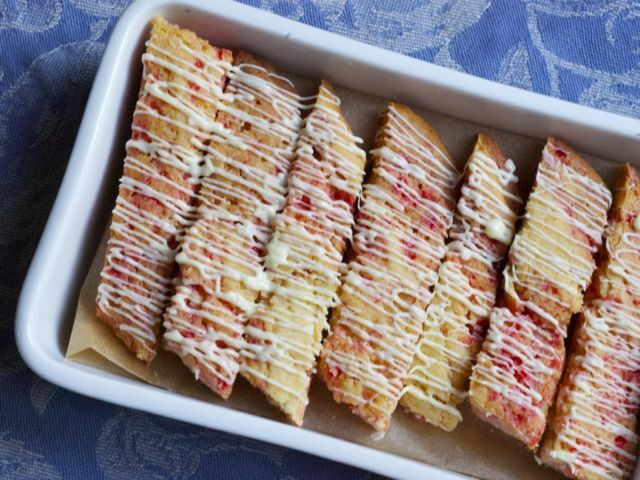 Culinate editor's note: Be sure to wait until the cookies have cooled before you drizzle them with white chocolate. Though the recipe doesn't specify an amount of white chocolate, we found three squares of Baker's to be sufficient. To drizzle, we used the Kitchn's plastic-bag method. Finally, we omitted the crushed-candy-cane sprinkles.